There is lots of activity here around my new home in the southeast Bronx. A century ago, one would have found farmland and manors on this little peninsula of Throggs Neck, but those have long since been replaced with tightly packed bungalows and the odd apartment building. Half a century ago, no highway came close to here, but now it is framed by four, two of which lead to the Whitestone and Throgs Neck Bridges to Long Island. On top of that, we are squarely situated right underneath the flight path to the airport, so if you are ever flying into LaGuardia, be sure to look out the window and wave as you descend, because chances are I will see your plane – I certainly will be hearing it! 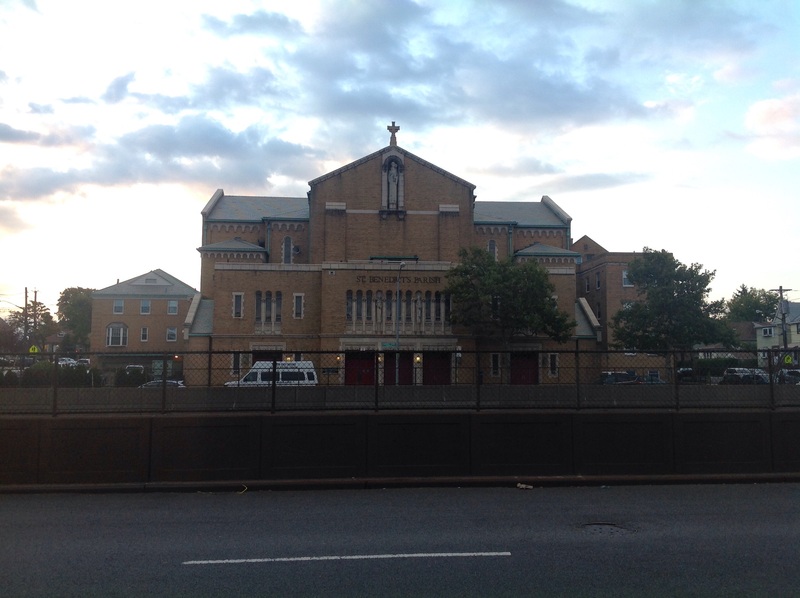 A shot of St. Benedict’s from the western side of I-95. In the midst of the hustle and bustle of this corner of New York City, my new home stands on an island in the midst of interstates. St. Benedict’s Catholic Church was built by the Benedictine order several decades ago, and just as their monasteries overlook river valleys in quieter parts of the world, this one-time monastic home overlooks I-95. There are no longer monks living here (the Archdiocese of New York took it over for the Benedictines about 30 years ago), but I like to think of this piece of property as my own “urban monastery.” Just as monks used to work and pray here, so am I settling into a simple and peaceful routine of ora et labora. My day begins early: I like to wake up in time to do an hour of personal prayer before daily mass at 6:45 am, which is well attended by folks on their way to work. Although it is short, it is a brief moment of communion and prayer as we all prepare to take on our respective days. After being strengthened by the Body and Blood of Our Lord, we all disperse into the City, ready to take on the world. After mass, I have breakfast in the rectory, during which I read the Wall Street Journal and catch up on the news. Following breakfast, I battle my way north on the Hutchison Parkway to St. Joseph’s Seminary in Yonkers. There is usually always some traffic congestion, so I have to give myself 45 minutes in order to make it on time for moral theology class. After class, I study for an hour or two in Archbishop Corrigan Memorial Library before going to the refectory for lunch. Following lunch, I hit the road again to get back to the parish where I spend the afternoon working on projects, writing, and answering e-mails. The three priests of the parish and I usually have dinner together around 6 pm. After dinner, I work a little longer before praying the rosary and vespers. Following vespers, I spend about and hour reading and studying before going to bed between 9:30 and 10:00 pm. While I am certainly taking advantage of being in the city to re-connect with friends, I am learning to love the normal days in my “urban monastery” as much as the days when I am out and about. My time in a religious order has helped me to appreciate a peaceful rhythm of life. Routine and stability are blessings since they free us from distractions and make our hearts more attentive to the promptings and inspirations of the Spirit. This is one of the reasons why I have decided to keep things simple. As a writer, and as someone preparing to be a spiritual father and a leader of souls, I feel that I need to keep unnecessary noise out of my life. For that reason, I have decided not to play video games, and to only watch a little TV on the weekend. These things are not bad in themselves, I have found that I need to limit my information input. Less unnecessary noise frees me to focus on “the things above” and ponder what God wants me do, say, and write. We are not all called to be monks, but as Christians, we are called to be the light of the world. To truly shine forth, we need to set aside time to be quiet and let God shine on us. According to your personality and situation in life, try to set aside one or two quiet evenings. (Sunday night is always a good choice.) Instead of watching TV, pour yourself a cup of tea, make yourself comfortable, and read a book. If you are the more active type of person, find a quiet project that you can do: put together a puzzle or play an instrument. Whatever the case, the important thing is to create a moment when you can relax and be at peace. These are the moments when God speaks.